When it comes to car safety, fully functioning headlights are an essential part of car care. No matter how skilled a driver you are, it’s always a good idea to follow car safety basics. Believe it or not, headlight maintenance is one of the most important safety features in your car. Sallas Auto Repair is a car care leader and we have some great headlight maintenance tips for you. Headlights are one of the most important safety features on any car, but they will only work as intended if they are properly maintained. A large part of headlight maintenance is the ability to identify some of the factors that can create dimming or incorrect alignment. Once you spot an issue, it’s time to make a repair. And if you’re unsure about how to make a needed fix, we suggest visiting your local auto repair shop. Regular Checkups – it’s not easy to catch headlight issues when you’re driving your car. So, when’s the best time to check on them? Whenever you have an oil change or fill up on gas, make sure to check your car’s headlights. This may seem pretty straightforward, but you would be surprised to learn how many people we see driving with headlight issues. Adopting this simple policy should prevent unsafe driving, something we can all appreciate! Headlight Wiper Blades – if your vehicle is equipped with headlight wiper blades, make sure they’re working well. These built-in safety features are a great way to increase your visibility on the road, so you’ll want to check out this set of wiper blades, too. 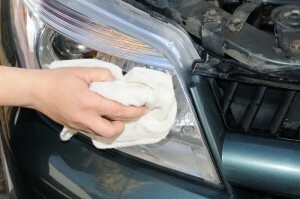 Squeaky Clean – regularly cleaning your headlights is another great car care tip. This, combined with other car care maintenance, will help keep you safer on the roads. So, next time you fill up your gas tank, give your headlights a thorough cleaning. If you cannot see drivers and pedestrians or be seen by other drivers on the road, your chances of an accident will increase. Because of this, it’s important to remember that headlights play a major role in safe driving. For a headlight repair or checkup, call Sallas Auto Repair at (816) 765-6060 or (913) 381-4555 – we look forward to serving you!